Dubai, the city of gold, is among the major hubs of travel and tourism. A large number of people from across the globe, plan their vacations and business trips to Dubai on a regular basis. However, apart from the frequent visitors of Dubai, there are some people, who wish to explore Dubai, but the prices of luxurious hotels in Dubai, stops them from planning any further. Most of the people, who visit Dubai first time, prefer to stay at one of the budget hotels near Dubai Airport. Staying at a budget hotel near Dubai Airport is quite convenient for the new visitors; they can reach their hassle-free, without confusing themselves from different directions and landmarks. Sometimes it is also difficult to find cheap hotels near Dubai airport, as there are many expensive ones located nearby. J5 Rimal Hotel is one of the most affordable hotels in Dubai, which is situated in Deira from a drive of 30 minutes to the airport. J5 Rimal is a hotel apartment, offering all the lavishness and convenience, similar to a 5-star hotel. Furthermore, J5 Rimal has integrated ultra-modern kitchens with necessary tools, facilitating guests to manage it according to their needs. Guests can dine in and enjoy at Pool Bar 24 hours a day along the poolside. Also, they can work out at the rooftop state-of-the-art gymnasium or rejuvenate and relax at the spa. J5 Rimal Hotel’s Classic Studio – Twin Bed cost around minimum $109 per night. Situated at a drive of 3 minutes from the Dubai International Airport, Le Meridien Dubai Hotel & Conference Centre is an ideal place for one’s stay. The hotel offers its guests free WiFi and free private car parking on the site. It offers accommodation similar to a 5-star hotel with a high-level of comfort, within one’s budget. The hotel charges approximately $131 per night in peak season. The Dubai World Trade Centre can be reached from here in just a drive of 10 minutes. Also, it is an ideal option for meetings, conferences and exhibition. The Le Meridien has set up a number of conference and meeting rooms, fully equipped with the proper audio-visual system. The hotel has 18 restaurants and bars, which are open for the guests as well as for other individuals. Guests can enjoy, rejuvenate and relax in 5 outdoor swimming pools, avant-grade gym, ultra-modern spa and floodlit tennis courts. One of the budget hotels, located near to Dubai Airport, is the Holiday Inn Express. It is at a walking distance of 2 minutes from the airport, just opposite to Terminal 3. However, the hotel runs a complimentary shuttle bus from Terminal 1 and Terminal 3 of the airport for its guests. Also, guests are offered a complimentary breakfast every morning. They can have lunch and dinner in the hotel’s restaurant. Exercise and have a view of Dubai at the rooftop fitness centre of Holiday Inn Express. Holiday Inn Express is situated at a location from where a number of attractions can be reached easily. Approximately, Emirates station is just 400 meters away from the hotel. The Dubai Financial Centre and Dubai Gold Souk are just 15 minutes away from it. After a hectic day, you can have a breathtaking view of sunset and relax at the Jumeirah beach, which is 20 minutes away from Holiday Inn. The hotel accommodates guests by offering the cheapest rates even in peak season. It is charged approximately $92 per night for the majority of the rooms. The Ibis Deira City Centre is one of the budget hotels in Dubai near airport. It is situated at a drive of 5 minutes from the airport. One can say it is in the center of the City Centre Deira. The hotel has been built with intricate design and magnificent architecture, blended with the conventional oriental design. Guests can avail complimentary WiFi and Novotel swimming pool. The hotel has 3 restaurants and bar, where guests can dine-in and have drinks. Guests can easily go for shopping, as the hotel is just opposite to City Centre Deira mall’s 370 shops. The World Trade Center is also at a drive of 10 minutes from the hotel and a few minutes away from the Gold Souk and Spice Souk. Ibis Hotel charges as low as $64 per night for its standard twin and double rooms. Premier Inn is a hotel, situated opposite to Dubai International Airport’s Terminal 3. The hotel offers highly affordable rates per night and hence, easily fits into one’s budget. Guests utilize the rooftop gym and swimming pools. It provides optimum comfort level to its guests with a complimentary shuttle bus service. Guests can daily visit the top attractions of Dubai with the help of the shuttle bus service, completely free. Also, Premier Inn runs this service to and from the airport’s Terminal 1 and Terminal 3 for its guests. The hotel is located 13 minute drive from the Dubai World Trade Centre. The top business hotspot of Dubai is also found nearby. Premier Inn room charges per night approximately $100. 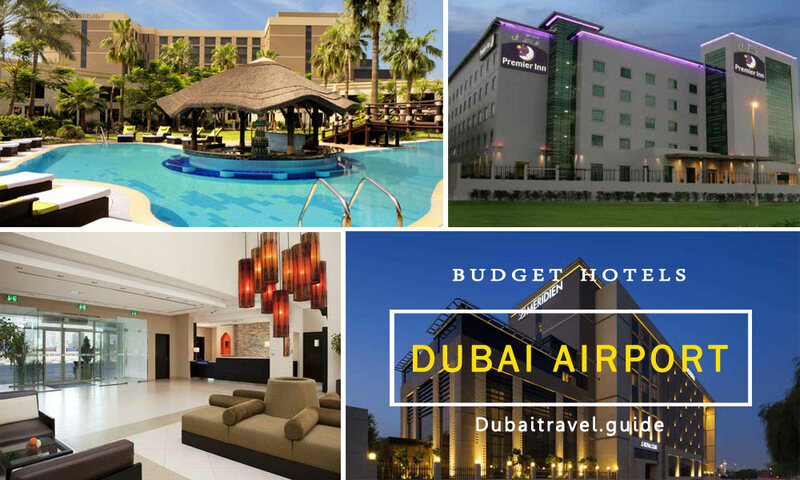 These are some of the recommended budget hotels near Dubai Airport. If you want to recommend a budget hotel, please do so by adding comments below.